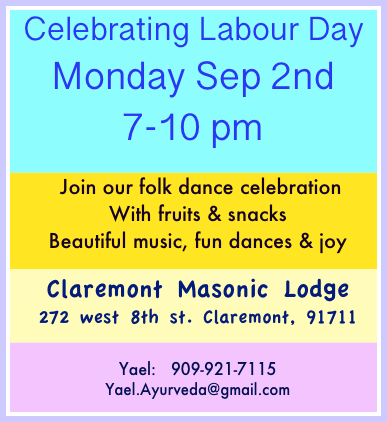 Folk dance brings out the essence of culture & community with tremendous joy and spirit. One can feel the sound of discovered water as we dance “Mayim, Mayim” (water, water). One can sense the wilderness of the desert, as we dance “Zemer Atik” (ancient desert song). “Esa Einai” (Psalm) I gaze my eyes up with the spirit of the Divine, while “Shema Yisrael” creates enthusiasm of Hasidic spirit dances. 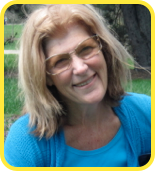 I was born on a kibbutz, and dancing and singing brought deep joy to all celebrations. It is my pleasure to share it with our community. Yael grew up on a kibbutz in the Galilee where sharing and celebrating life always included songs and dances. While living in Columbus, Ohio, she had an Israeli band. She also put together a group called “Shalom Yeladim” for children of ages 6-13. 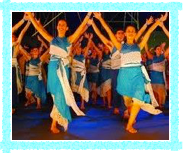 She took this amazing group of children to many stages around the State to perform dances from biblical to modern israel. In Ohio, Yael worked with “Artists in the Schools” to share the life & culture of Israeli kibbutz life. 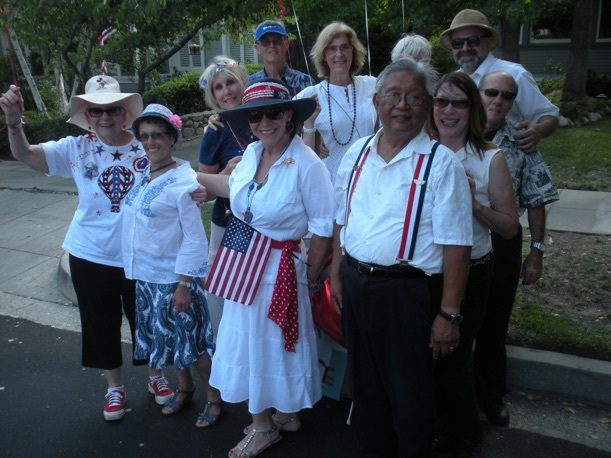 Her Monday night group in California has its unique spirit of teaching old and new dances in a friendly - fun environment. 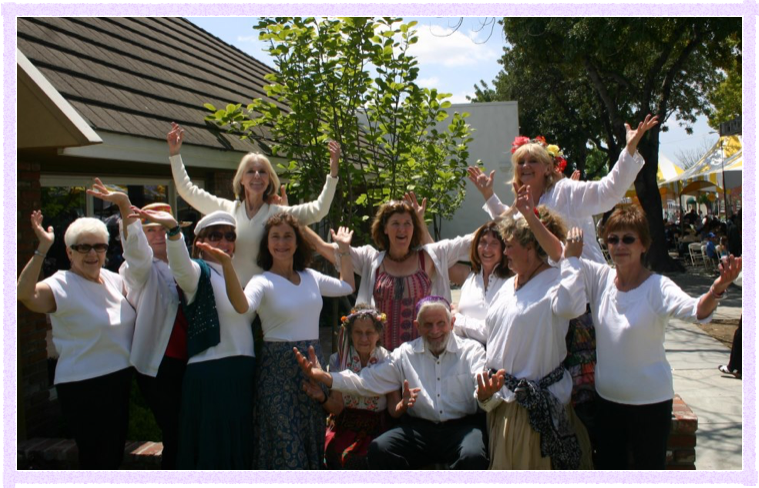 adult groups at Temple Ami Shalom (West Covina), as well as Temple Sholom (Ontario), Rancho Recreation & Claremont Jocelyn Center. 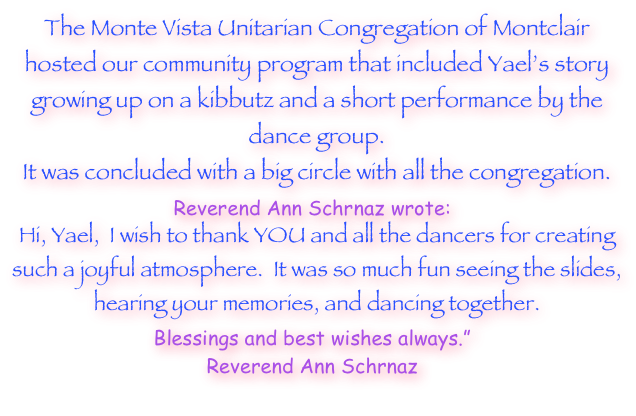 ”Yael, you and the other Israeli dancers were absolutely wonderful. Music and dance bring so much to a program and you all have been so gracious to brighten our world. All the best to you and the others, and please convey my deepest gratitude for their participation.